Boxt asks for 5 minutes of your time to answer a few questions online. They will then instantly recommend the boilers that will fit your home so you can compare prices and choose the boiler you want. One of Boxt’s 70 gas safe installers will pick up the job from there, allowing your boiler to be installed within just 24 hours. And without an army of salespeople to pay, Boxt can offer you a great deal on the same A-rated boilers that you’re used to, as well. The boilers Boxt provide are from the Worcester Bosch brand; not only the UK's most loved boiler brand but arguably one of the best in the business. Worcester Bosch are top of the Which? gas boiler report and have been for the last 8 years. Not to mention, every single one of their Greenstar gas boilers has been awarded a Which? Best Buy. With one of these boilers, paired with a Boxt 10-year warranty, there's no better choice for your central heating. Boxt put a free filter in every boiler they install, worth up to £130 RRP. It filters nasty bacteria and unwanted residue from the system water to protect the boiler and to ensure it stays in top condition for much longer. With every Boxt boiler, you also receive a free Honeywell Wireless Smart Thermostat worth £199.99. Get the latest in central heating technology free with all wall-mounted combi boilers from Boxt. Or select the Honeywell Wireless Smart Thermostat as an optional upgrade on other boiler types. With this smart thermostat, you can control your central heating from your phone, wherever you are. Adjust room temperatures, set timers or switch the heating on or off, whether you’re in the house or not. It’s easy to do using the app or by simply tapping on the intuitive touchscreen on the thermostat too. If you’re looking for extra information or advice on your boiler or boiler services then check out the blog section at Boxt. Here you can discover an array of articles, news and expert advice on how to save with your new boiler, when to replace your boiler, why you should avoid buying budget brand boilers and much more. You can also find buying guides on things like combi boilers, the types of boilers available, Worcester Bosch boilers and installation services near you. The posts in the blog section are updated regularly so you can always find the information you need on your central heating with Boxt. Will my boiler come with a guarantee? Yes all boilers come with a warranty of up to 10 years. Can I pay for my new boiler in installments? Yes, finance is available, allowing you to pay in installments of up to 120 months. Boxt's finance platform is Divido and our lenders are Shawbrook Bank ltd and Omni Capital Retail Finance Ltd. Please note that credit is subject to staus, affordability and a credit check. With 62 years of combined experience in central heating, the founders of Boxt used their knowledge and expertise to create an easier way of finding and installing affordable boilers. 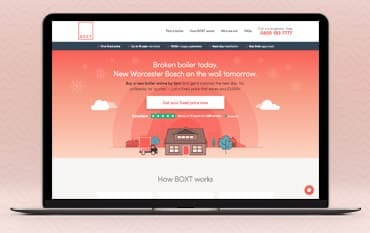 For years it was impossible to buy a boiler without a visit from a salesperson first- a concept that many customers dislike, which is why Boxt founders Mel and Alan created an online boiler service with no sales patter or delays. Boxt can have your boiler up and running within 24 hours and provide customers with savings of up to £1379. And, if you place your order using a Boxt discount code from us you can add even more savings on this already impressive discount too.